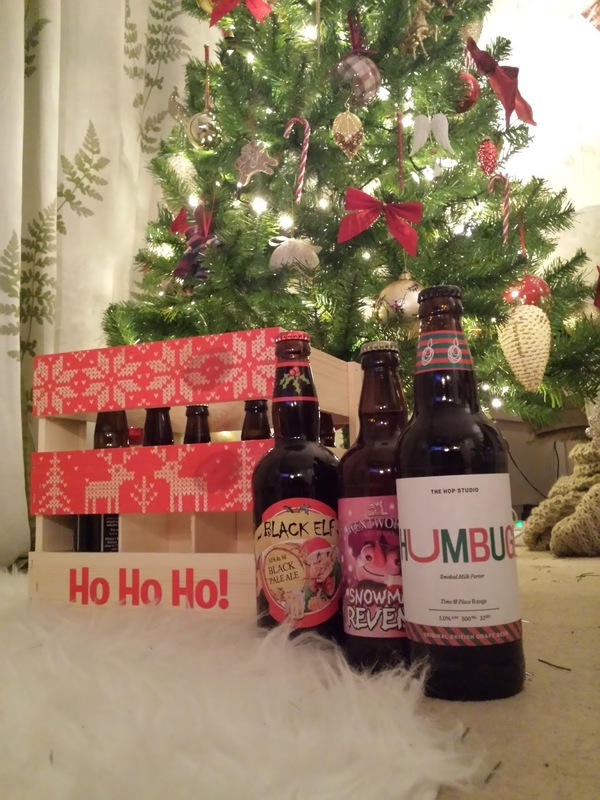 Best Of British Beer: Ho Ho Ho Crate. It's always nice when an early Christmas present arrives in the post. Even nicer when it comes in the form of Best Of British Beers Ho Ho Ho Crate! As many of you know I am a huge fan of these chaps and it was jolly nice of them to send me this gorgeous thing as a little present so I can tell all of you just how awesome it is. Best Of British Beer do some amazing gifts from personalised beers, specially mixed cases and even beer advent calendars (it's not too late!) I can't think of anyone who wouldn't want to unwrap one of these beauts on Christmas morning. Let me take you through the many reasons why this crate is great. First of all, LOOK AT IT!! So beautifully presented in a handmade pine crate and decorated like your favourite Christmas jumper. What's even more great is what's inside it. Nine hand-selected beers from the 2015 Christmas collection. There's all sorts of winter warmers inside. A rich ruby ale in the form of Great Newsome Brewery Winter Warmth, a fruity and spicy number with plenty of backbone. There are deliciously smoky porters. The offering from The Hop Studio, aptly named Humbug smells of roaring log fires and chestnuts roasting upon it. Cheddar Ales take a slightly different approach with their Festive Totty, a Porter with Port! It's like Christmas in a glass! Spicy, fruity, malty and with hints of raisins. Strong ales feature heavily with an appearance from Byatt's Brewery XXXmas. A naughty little number that comes alive as soon as it touches your tongue with lashings of Christmas spice and a really long bitter finish. Wentworth Brewery throw in Snowman's Revenge whose caramel and nutty notes are just what's needed when curling up on a cold night. Two surprises were a couple of wonderfully different golden ales. Hopsicle, a very limited edition brew from the chaps at BOBB themselves is probably one of my favourites of the case. It's full of tropical fruit and grassy notes that one would find in a more summery brew. Ding Dong from Monty's is crisp and dry and perfect for the New Years Eve session. Finishing it all off is Black Elf, a black pale ale from Ridgeway Brewing. Red fruit, burnt sugar and a real mouth drying bitterness are all abundant and the perfect way to finish off the greatest Christmas beer case ever! It's on at an amazing £34.50 from Best Of British Beer and in all honesty, I think that is an excellent price. If you're worried about delivery, don't worry, it does come delivered inside a plain looking cardboard box so as not to ruin the surprise. Plus it makes it easier to wrap! Better act quick though because it's only reduced until December 10th!